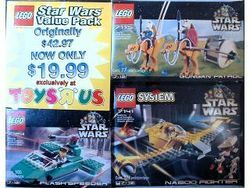 65028 Star Wars Co-Pack is a Star Wars Bonus Pack that was exclusively available at Toys 'Я' Us in 2001. Included were 356 pieces and 7 minifigures. It was based upon the battle of Naboo in Episode I: The Phantom Menace. Facts about "65028 Star Wars Co-Pack"
This page was last edited on 12 January 2016, at 21:06.